– We see part of a woman’s abdomen when a man examines a bloody injury after a helicopter crash (please see the Violence/Gore category for more details); the man checks the wound daily and we see a glimpse of uninjured skin. - The film is set in the Artic, with blizzards, high winds, snow-covered mountains and desolate fields of rocky ice accompanied by ominous music playing several times. 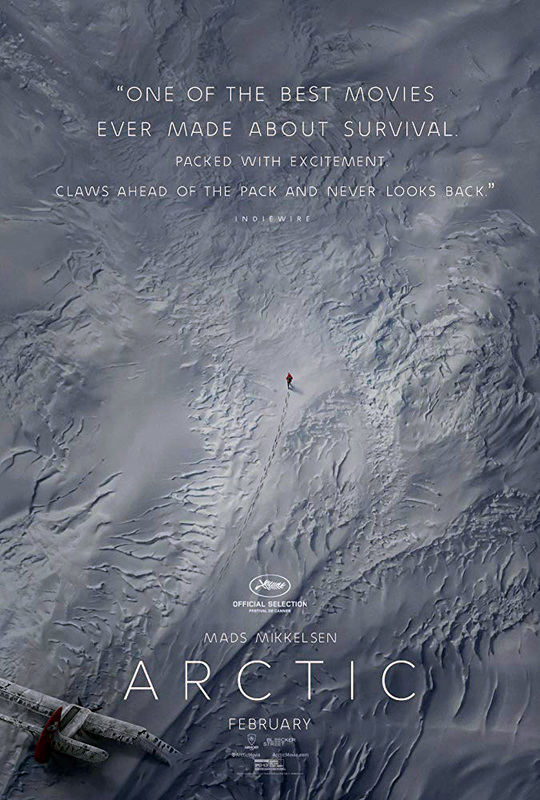 ► A man in a cave with an injured woman hears a polar bear growl several times off-screen; the animal's face and open mouth appear in the small cave opening, roaring with sharp teeth and the bear sticks its head in the opening three times and the man lights a flare and holds it so that sparks fly into the bear's face, causing it to rush away. A man sees a large paw print in the snow, startles, and rushes into a wrecked airplane for shelter. A man sees a polar bear in a long shot and the bear walks away. ► A man falls into a deep hole in the top of a cave where he awakens to find his foot trapped under a boulder; he grunts and shouts in pain, lies back, gasps and sits up, he pulls the leg out (we hear crunching), and he crawls around the cave and up over sharp rocks to the exit (we see spots of blood in the snow later and in a close-up we see a wide, bleeding gash in his calf). A man rushes toward a crashed helicopter, pulls open the doors and finds a man dead in the cockpit (we see blood on his forehead and one cheek), he lays the body in the snow, takes his parka, gloves and cigarette lighter, and gobbles down a pack of uncooked ramen noodles (we see the dead man covered in snow later). A man finds a woman wearing a parka and snowsuit hanging upside down in seat restraints in a crashed helicopter (we see some blood on her forehead); he pulls her down and finds an abdominal injury (we see a wide band of her abdomen with a bleeding gash and muscle tissue visible) that he staples closed with a medical stapler before covering it with gauze and bandages. ► A stranded pilot receives a signal via an aircraft radio, sees a helicopter approaching, and shouts and waves a smoke flare; the chopper is jostled by high winds and it cannot right itself, it is blown around the wrong way, flies a short distance and crashes nose first into snow in the background with a flash of fire, smoke and a muffled thud (a closer shot shows the tail piece broken off). ► A man places an injured woman, heavily clothed, into a winter sleeping bag and wipes her forehead with a hat, implying that she has a fever; she squeezes his hand strongly to show she is OK and grasps his hand later to say thank you, because she is too weak to talk and the man places her into a rescue sled with supplies and equipment. A man writes "2 alive, headed north" on the side of a plane, he ties a sled with an injured woman and supplies in it to his body with heavy cords and walks away from a wrecked plane; he walks all day, sometimes falling to his knees and resting, the weather is very windy and the snow is deeper the next day, snow blows into his face and he walks slowly and he curses when he finds a craggy ridge not on his map. A man grunts loudly while trying to pull a sled with supplies and an injured woman up a steep icy hill by thick cords and loses his grip three times, sending it sliding back to the bottom and he lies back panting and exhausted. A man trudges slowly through a blizzard, pulling a rescue sled containing an unconscious woman and he falls to his knees, slides the woman off the sled and anchors the sled on edge as a wind barrier; he gets into the large winter sleeping bag that the woman is in, awakens in the morning and struggles to dig them out of accumulated snow. An injured man trudges through snow pulling a sled and using a cane to help him walk. ► A man beside a fire on a rock looks at an injured woman's face and we see that her eyelids are brown and red and blood flows from one corner of her mouth, he checks her abdominal wound and sees that it is bleeding again; he places a photo of her family in her hand and zips up the sleeping bag she is in, perhaps thinking that she is dead. A man stranded in the Arctic pulls off his socks and we see red and brown toes, indicating the start of frostbite. A man's hands and fingers are stark white with red fingertips, indicating frostbite. A man's face is wind-burned dark red in several scenes and he has a scratch on the cheek that opens up and bleeds down his face a few times. A man checks a woman's abdominal wound daily and we see redness; the woman remains semi-conscious throughout the film, she grunts a few times, squeezes the man's hand so he can test her strength and consciousness and coughs for several seconds in a few scenes. ► A weak, limping man pushes a sled containing an unconscious woman up an icy hill, his face and lips are badly wind-burned and bloody; he sees a helicopter land in the distance and mumbles toward two men walking around it, he shouts loudly and waves a flare, sets his parka on fire, and waves it on the end of a pole, but the two men enter the helicopter and fly away; the man cries, lays near a woman in a sled and closes his eyes as wind picks up and the sound of a helicopter becomes increasingly loud. ► A man lives in the wreckage of an airplane in bitterly cold temperatures after a crash we do not see and we surmise he has been stranded for about two months. A man sits wearing a parka and snowsuit for hours and he cranks a radio to contact any nearby aircraft, he uses a pole to dig out a large SOS in the ice and hard ground, he tends to fishing lines in three small holes in ice over a lake and we see him pull up three fish in different scenes. ► A man pulls fishing line out of water and one fish flops a bit as the camera zooms to a long shot and we see the man hit the fish in the head to kill it (we do not see the injury). We see four fish in a cooler and several fish in a larger metal box. ► A man takes a fish into plane wreckage and cuts it open lengthwise to expose flesh and bones, but no blood; he cuts fish meat out and eats it. A man cooks some fish over a propane gas ring and feeds some to a semi-conscious injured woman. A man puts a frozen thermos into his waistband to melt snow inside it, yelping at the cold. ► A man cleans snow off a pile of stones left in memorial of a dead person that we never see. In a later scene, the man builds another short stack of stones to memorialize another dead person. - A man pours ethyl alcohol over a woman's abdominal wound three times. - Harsh Arctic climate, airplane crashes, wild animals, danger, fear, serious injuries, vulnerability, exhaustion, regret, death, man versus nature, survival, responsibility, resourcefulness, persistence, giving up, sacrifice, compassion, comforting strangers. - The harsh extremes of nature bring out human vulnerability as well as determination.